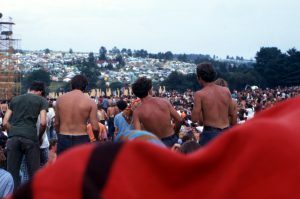 One of the goals of my Bethel Woods Museum tours is to more accurately present the Woodstock Music and Art Fair. Clear up that Woodstock haze. Guests typically chuckle and I add, “Look at the rest of the pictures and find the hippies. Find tie-dyed clothing.” Picture perusal yields little of either. 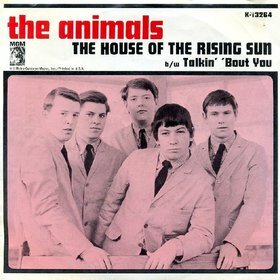 On September 5, 1964 “House of the Rising Sun” by the Animals hit #1 on the Billboard Hot 100. They had recorded it on May 18 and released it in the UK in June and in the US in August. At 2:58, the song barely made it under the AM radio de rigueur 3 minute limit. When songs by British invaders like the Rolling Stones and the Animals started playing on American radio airwaves, many teenagers loved their gritty soulful feel. Little did we innocent and naive white segregated American teenagers realize, as the Stones and Animals did, that the songs were American. “House of the Rising Sun” is such an example. The song’s origins may go as far back as the 1700s. The classic American bluesman, Leadbelly, recorded two versions in the mid-1940s. As with many musical genres, the Animals adapted the song’s story to their own way by changing the viewpoint from that of a woman to that of a son whose father is satisfied only when he is drunk. This was not She Loves You, Hello Dolly, Everybody Loves Somebody, or any other of 1964’s #1 songs. Its intensity and darkness set it apart. You can find more about the song’s history via a American Blues Scene link.